CareMore stairlifts are one of the UK's most trusted suppliers of stair lifts. With cheap and competitive prices on all our products, each stair lift is made and installed to a high level of quality. The websites creator or author is Caremore UK Stairlifts. 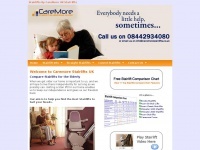 © Caremore UK Stairlifts is the owner of the copyright for this website. The web server used by Caremorestairlifts.co.uk is run by Krystal Solutions LLP and located in Great Britain. There are many websites run by this web server. The operator uses this server for many hosting clients. In total there are at least 122 websites on this server. The language of these websites is mostly english. The Caremorestairlifts.co.uk websites were developed using the programming language PHP and served by a Nginx server. For managing the data of the webpages the CMS WordPress is used. XHTML 1.0 Transitional is used as markup language on the webpages. Indexing the data of the website and following hyperlinks on it is explicitly allowed by robot information.